Cold weather is on the way and moisture is building. We left the lodge here at Canadian Trophy Quest in a pretty thick fog. Rob suggested I hunt a stand that I spent all day in two years ago. It was a terrific stand carved into a spruce tree and overlooking a breathtaking stand of poplar. Thirty minutes after Rob dropped me off I could hear the sound of footsteps. I glanced to my right and could just about make out a rack in the early morning light. I pulled up my glasses and sure enough it was an 8 point. He was not a shooter. A few minutes later as the light improved another deer was approaching. 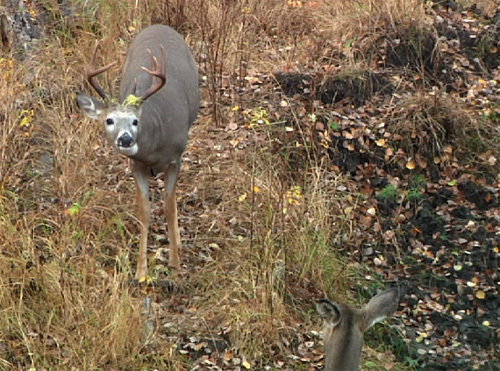 This one turned out to be a nine point and from the side he looked like he could be a shooter. As I glassed him I knew he wasn't. 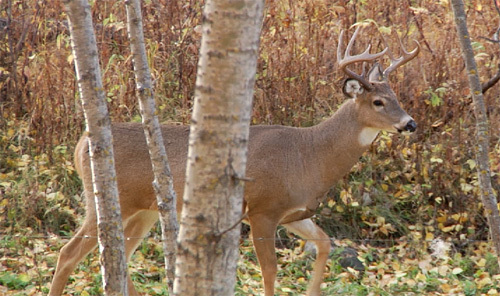 The two bucks fed for 30 minutes while a bunch of does started to filter in. The cool morning with the fog seemed to get the bucks in the mood. They started chasing the does around. Pretty early to see chasing and definitely a good sign. This went on for nearly an hour before they all moved off into the poplars. It was a great morning. The afternoon was back to a stand with a 30 yard shot to the bait. I remember this stand well. Two years ago I got to this stand in the dark and when I raised my bow up I realized my sight had fallen off. Today I had better luck. I wasn't in the stand for 30 minutes when a 2.5 year old buck showed up. He was not a shooter this year but he will be in a year or two. Twenty minutes later another buck showed up, this time a 1.5 year old eight. 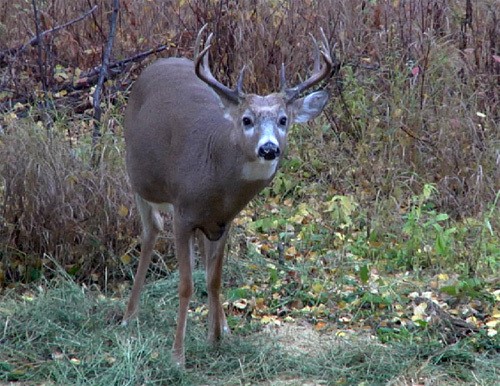 He was submissive to the nine point who wouldn't let him near the bait. So instead of feeding he chased does around. Forty minutes before last light a nice 9 showed up. He was a 3.5 year old buck and mature, but his rack wasn't quite what I was looking for. He might be in trouble on the last day - but probably not. Today was a great day. 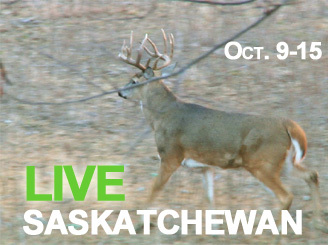 Lots of action, some rut activity, and five different rack bucks. The weather is turning colder and things should keep getting better.